What He works through us together will far surpass what one person can accomplish alone. If you missed Part 2 last week, you can find it here. Before we move forward with the final lesson of this series, I’d like to honestly admit a struggle I have with friendship. You see, I don’t consider myself good at the whole friend thing. Now before you get upset with me, rest easy. I’m not trying to put myself down. I just believe honesty is important. Sharing our struggles brings us together. Sure, I’m quick to listen when a friend needs an attentive ear. And maybe I can offer tender words of support if called upon for that purpose. But I’ve never been one to intentionally seek out those connections. I just hang back and wait for things to happen naturally, but recently I’ve become convinced. Friendships won’t happen without intention. This simple point brings me to my third reason Why Friendship Is Worth the Risk. I happen to know a woman who illustrates this point perfectly by the way she lives her life. She has four kids, the oldest a college graduate and the youngest in grade school. She has a LARGE extended family, and she opens her home to anyone in need as God directs her. Yet she still makes time for connections with friends. How can a sweet lady with such a busy household find time for lunch dates, texts, and dinner conversations? Simple. She puts God first, then makes time for others. It’s in the small things that this humble lady leaves her biggest mark for God. Making time for fellowship with the friends in our lives can be just the thing someone needs to find the strength to face another day with a smile. We may never see her picture on a billboard. (She’s a little shy about photos of herself, anyway.) But her influence is far-reaching through the simple gestures that bless others. 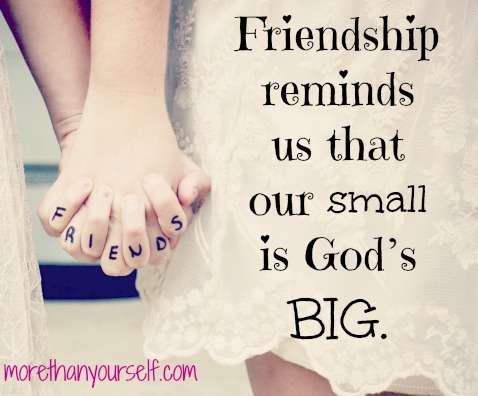 Yes, those things may seem small to us, but they are BIG to God. As we wrap up the month of May next weekend, I pray you will find an opportunity to visit with a friend and nurture your God-given community. We see more of Him through them. Interested in more words of encouragement, devotions, and teachings based on God's word? Visit some of my favorite sites by clicking the buttons in the sidebar on the right!